Discussion in 'Android Devices' started by lennydude, Aug 8, 2010. Derivative Trader - AIG "JK"
Just bought a new EVO 4G. I have it updated to 2.2. I LOVE the phone! Coming from the HTC Incredible which i also loved, i wanted the front camera, 2.2, and mostly the screen size. When i had the Incredible on VZW it was getting anywhere from 1400 to 2000 and more download speeds! Any ideas and/or what do you get? PS I live in the Portland, Maine area. Sorry, but I have to check: do you get 4G in your area? Does your Evo say 4G in the status bar when you are running the speed test? What app or web site are you using to do the speed test? Numbers are sketchy at best with speedtest. I had problems in the past with numbers but in the last month they have tripled. It all depends in coverage with 3g. My numbers went from low hundreds to high thousands.2.2 has helped a lot also. I wish I could explain why but as long as the numbers are good and pages load fast, I am happy. It is likely just a problem with the 3G infrastructure in your area. Speedtest's are pretty sketchy in my experiences. I live in Phx and usualy get anywhere from 1000kbps to 2300kbps down. Just now ran a test and got 2293 down. But, even at the lower end, it performs the same in the browser. 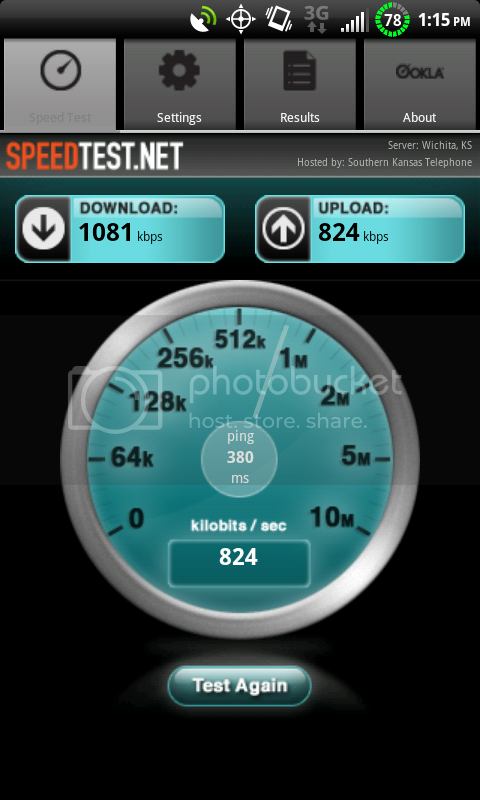 I wouldnt worry about what you see on the speedtest apps, as they are not known for accuracy. If your phone load's webpages and downloads data fast... you're good to go... thats all that matters to me, anyway. I never have a problem downloading files or webpages. The EVO DL's data faster than any phone I've owned(BlackBerry, Moto Q9, Palm Pre), or seen. why are speed tests unreliable? All they do is make you load an image (for the downstream test), which is just like loading images on web sites. The good ones simulate several small images and text to further replicate the browsing experience. I dont think the speed tests are sketchy at all, I think they are pretty accurate. I think people are in denial that Sprint's 3g network is slow and spotty(speed wise), however it is very reliable and can service any data dependent app just fine. In the town I live in I can get 1.75-2 down and a mile down the road get under 1mb/s. When I was with ATT it was pretty consistent around 2 mb/s but dropped calls made the service inferior to Sprint. I know there are differences with CDMA/EVDO versus GSM/HSPA however ATT clearly has Sprint and Verizon beat with 3g. I even tested an X and my Evo side by side, each phone had full signal, VZW was around 1.5 down and my EVO was 800k down. If you want fast go with ATT, if you want consistent and reliable service with a slower connection go with Sprint. Bottom line, it is what it is. If you are lucky to have 4g it is absolutely blazing fast. Makes me very excited for LTE with VZW. Thanks a million to all of you. My experience has been exactly as you say. If your phone load's webpages and downloads data fast... you're good to go... thats all that matters to me, anyway. I never have a problem downloading files or webpages. I can run the speedtest app three times and get big disparities in the UL/DL speeds. It will always run much slower on the first test and then pick up on the second. I was in the boonies the other week, and speedtest kept telling me I had zero up and down. But I could surf the net without issues (actually, it was pretty fast). 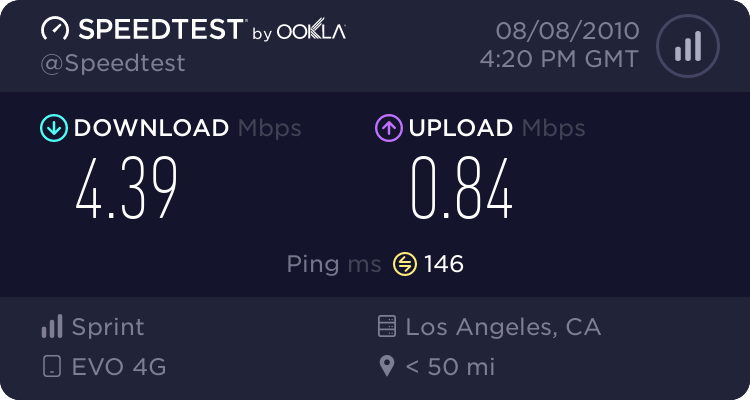 But no matter how many times I ran it, speedtest kept telling me I had zero up and down. So I have zero confidence in the numbers it returns. And no, I wasn't on wifi, it was off. I have a cottage in the mid-(Maine)coast area and get much faster speeds than that. I also get faster speeds up an down the ME pike. Sprint has much better and faster coverage than AT&T along the Maine coast. but there are still areas without good coverage. Take your phone to some other areas and re-check your speeds. why are speed tests unreliable? The number one reason? Server placement. Speedtest.net never selects right server for your area. They seem to have server connection issues with their own app. To anyone that wants to do a speed test. Please delete the speedtest.net app off your phone before you do the test. Then go to the website. Do a speed test from both websites, using the browser, selecting the closet server to you. I think the speedtest numbers are pretty accurate but mine seemed to come down to whether I was using GPS or not. If I use GPS then it pulls a server that is a few miles away and if not, it pulls a server somewhere in Kansas. I have no clue why. It is indeed spotty, but very reliable. I live in Raleigh, NC and the 4G numbers are always around 2Mb down and 1Mb up. I got the same results in Greensboro, NC and in Atlanta, GA. Using 3G I am typically around .5Mb down and .5Mb up. If you're using a particular speedtest app or web site, and it can't give you consistent readings, move on to a different speed test. speakeasy's speed tests are widely used in tech companies for reliable results. I can run 10 tests and come close on all of them. That said, if your signal is weak, then you will have a much larger variability in your results. Also keep in mind that you can't make generalizations like "verizon gets faster 3G speeds than sprint." It all depends on how close you are to your provider's tower and the amount of obstructions in between. Day-to-day humidity changes affect the rate as well. In my experience, all of the providers provide roughly the same level of service. There will always be areas with awesome speed, and pockets where reception is terrible. No provider is immune to this. 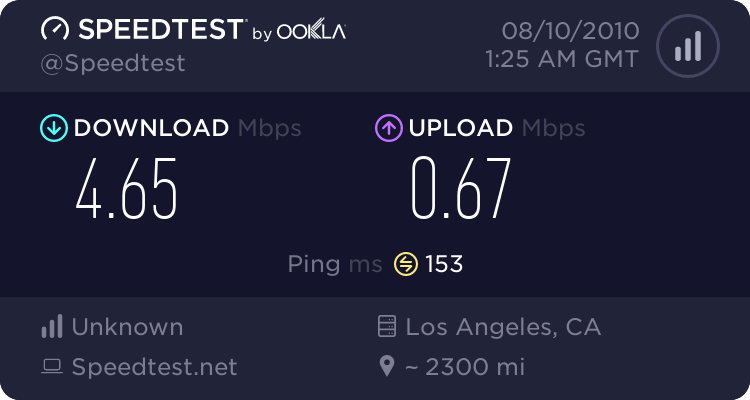 Just ran the Speak Easy Speed test off the LA Server. Several times. 4G Enabled here in OC California. Fair 2 Bar Signal. Consistant at 10Mbps Download. 1Mbps Upload. Did someone mention WiFi ? This signal is twice as fast as my Business DSL. Ran mine yesterday morning here in Los Angeles near LAX. Walked outside and ran it through the website.